Just when I don't know how many more lessons I can learn from this infertility and adoption journey, God drops another one on me! Dave Gibbons [Newsong's lead pastor - my boss and friend] shared today that our response to pain typically goes through a few phases. First, there's some denial or ignoring that the pain isn't that real or that bad. Next, we realize that avoidance doesn't make it go away, so we acknowledge the pain. Then, we learn to accept the pain in our life for everything it is. But the final phase that many of us never get to is receiving that pain as a gift from God. Pain is a gift, though it requires a change of perspective to see it as such. It points us back to a God who loves us and promises to heal us when we are willing and open. Pain can be best teacher because it's a God's megaphone to our deaf ears [C.S. Lewis]. And pain can become beautiful because is refining, sharpening, and intensifying God's beauty in us. If you are in some pain today, I pray that because of God's beauty you will find strength for today and hope for tomorrow. I pray that beauty will rise from our ashes. 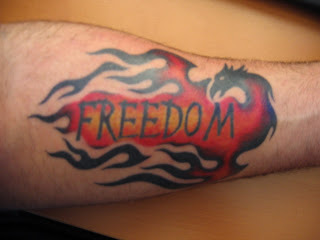 **Picture above is of Brian's tattoo of a phoenix rising from ashes. The image for him produces the true freedom we all long for. to further explain this beauty and freedom from ashes.